A screenshot of DisMod II’s main form. A much more user-friendly graphical interface. A wider range of possible input variables. Build-in tools for smoothing and fitting. While DisMod II was developed from the perspective of Global Burden of Disease studies, it may be of use for epidemiologists and public health researchers or anyone else trying to estimate the epidemiology of a disease. Generally three out of a list of seven potential input variables will suffice to calculate a complete description of a disease. ¨ Database to store and retrieve data (MS Access format). 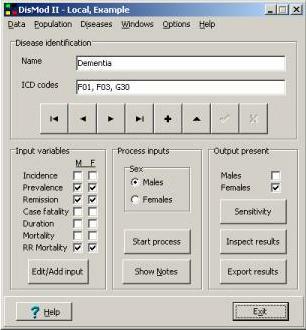 DisMod II is a tool to help estimate the epidemiology of a disease. 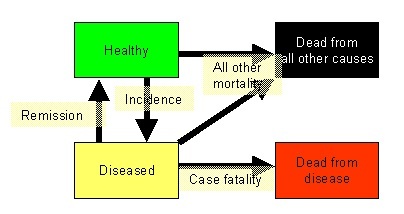 It exploits the fact that disease incidence, prevalence, remission, case fatality, and mortality are not independent variables. DisMod II, © World Health Organization.